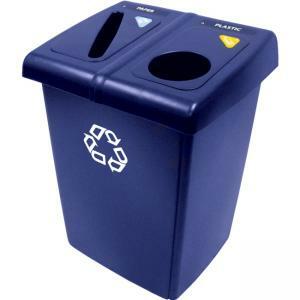 Glutton Recycling Station supports your facility's recycling program, helps reduce labor costs and improves worker well-being. High-capacity, all-in-one, centralized solution is designed for efficient waste sorting. Recycling Station offers restrictive-opening tops. Symbol and word label pack provides visual cues and encourages compliance. Hinged lid allows easy access during emptying. Station includes two Glutton 56 gallon containers, four Slim Jim 23 gallon containers and one hinged lid frame. Eight restrictive-opening tops include circles, paper slots, square, and triangle. Included label pack includes symbol and word labels in English, French and Spanish.